I heard it before we got to Rome, when we were in Rome, and after we left Rome. And I’m reminding myself of it now as I write this blog post. Rome is a historical lasagna. There are literal layers upon layers upon layers of history within this city. Seriously, Roman history is stacked upon itself; there are ancient churches, streets, homes and more beneath the streets and buildings of Rome. It’s honestly insane, I don’t really understand how it happened. How did people build on top of what already existed? How deep would we have to dig to find the original Rome? Either way, Rome contains a vast amount of history, history that would take you over 3 lifetimes of studying to fully understand. 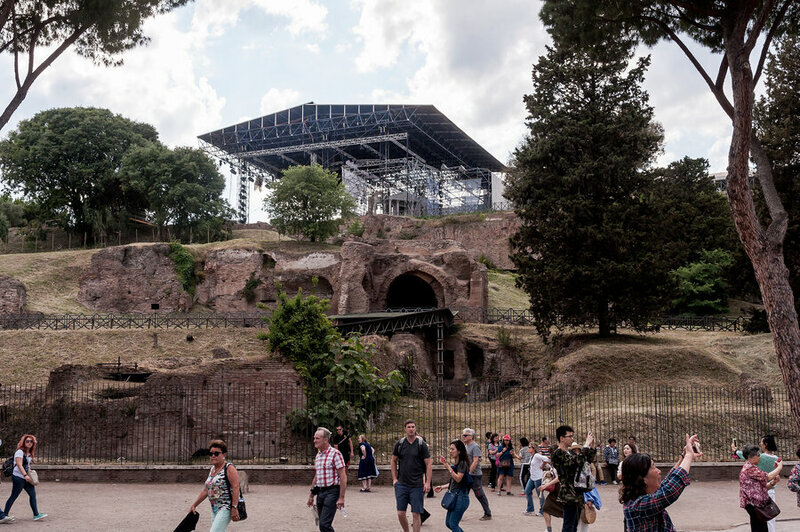 When we were on our tour of the Roman Colosseum and Forum, our tour guide Olga pointed out a massive, newly built stage on top of the hills of the Forum. Apparently some group of people believed that it would be a good idea to completely and utterly disregard the incredible history of the Roman Forum and construct a stage on top of it all. As she mentioned this, Olga expressed her sheer frustration and disappointment with the people who decided that building a stage in this location would be beneficial to the city. Olga was angered that people would consider a concert/musical to be more important than the thousands of years of history within the Roman Forum. Why would these people desire to destroy the Roman Lasagna? Not only does it look tacky to have a modern stage in the beautiful space of the Forum, but it speaks volumes to the unfortunate idea of consumerism in today’s society. People would rather spend time and money to market a new hit-show than conserve the fragile history of the city. It’s sad to think that our society emphasizes our wants and needs in the moment before thinking about the broader implications of these actions. Upon further research, I found out that this stage was built for a new rock opera about Emperor Nero that opened on June 6. Many people were excited for this new show to open, partly because it was controversial (the storyline and this play’s location). However, by intermission of opening night the audience was unimpressed and many walked out of the play. Audience members were upset with the play’s vulgarity and historical inaccuracy, so they left. Since opening night, the play has only attracted a couple hundred spectators per night. The arena was built to seat over 3,000 spectators, so it is obvious that people are upset with this play. Tomaso’s quote sums up what Olga and many other historians and civilians of Rome believe about this stage. It’s sad that we overemphasize commercialization in today’s society. As seen here, we are too quick to make things about money – where we can make the most profits and bring in the most visitors. We see this during every holiday season in America – we lose sight of the real meaning of Christmas, we make thanksgiving more about Black Friday than spending time with loved ones, and we care more about the fireworks shows than the historical impact of the Fourth of July. I would love to see this aspect of our society change. I would love for us to embrace simplicity. To find joy and fulfillment in what we already have (like the Roman Forum), rather than what we could have (like a bad musical about Nero). The stage in the Forum, for reference.